1 - Warhammer 40K: Space Marine Review 2 - Warhammer 40K: Space Marine Review - Kill the Xenos! Violence in video games is often a touchy subject, but if we’re being honest, and despite all the swearing, it rarely strays beyond 90s action film levels. Bad guys appear, bad guys take a few bullets and bad guys fall down, but they're often visibly unscathed by the assault rifle/laser gun /rocket launcher/machete. We haven’t been desensitised by violence, so much as exposed to watershed-safe levels. The Warhammer 40,000 universe doesn’t have a watershed though; it’s a world of chainswords that hack enemies in two, bolt guns that cause their victims to not just die, but explode when hit, and plasma weapons that burn and blow enemies into pools of screaming, bubbling goo. Thankfully for 40K fans, Space Marine - Relic’s first attempt to take the 40K licence away from RTS territory - faithfully recreates the ultra-violence to visceral, and often hilarious levels. It won’t be getting a 12A certificate any time soon. You play Captain Titus, of the Ultra Marines (chosen as the most approachable chapter of Space Marines, despite many fans' dislike of the straight-laced blue-armoured ones), with your small team sent in to slow the advance of an Ork invasion until the space cavalry can turn up. The action is handled from a third person, over the shoulder view point, but you would be wrong to think this a Gears of War clone in fancy blue armour. For one, there’s no cover system whatsoever, as the unstoppable might of a Space Marine omits the need to cower behind crates. 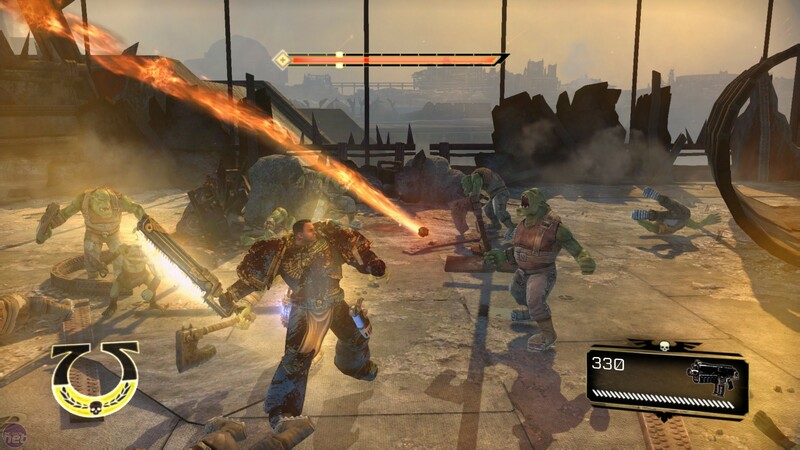 Instead, the onus is on getting up-close and personal with enemies before slashing away with devastating melee weapons; the chainsword, power axe and 40K fan-favourite the thunder hammer all feature. There are no complex combos to learn, though, and combat often degenerates into simply clicking the melee button until all the enemies are in small bits around you. It might sound mindless, and it lacks the fluency of melee combat in Batman: Arkham Asylum, but the feeling of power that Space Marine gives you is palpable. When you unload a bolter into an Ork mob, gibbing the front runners before charging in, then slashing and whirling through the survivors in a rampage of gore and steel, it’s difficult not to wear a grin the size of a battlebarge. You’re no normal grunt; you’re a walking tool of the God Emperor’s will! This will hurt you more than it'll hurt me! In another break from modern gaming conventions, there’s no automatically regenerating health to be found either. Your armour offers a certain amount of regenerating shielding, but once it’s gone and you’re eating into that health bar, you’ll need to perform executions to top it back up. 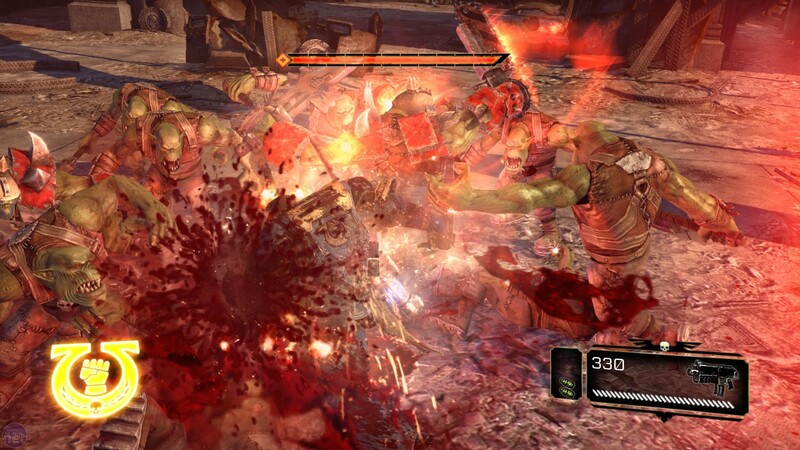 These are performed by first stunning the enemy, an action that can be chained into melee attacks, and then tapping E. The executions take the gore-o-meter to new heights, with enemies hacked in half, beheaded and smashed into pieces depending on what melee weapon you’re carrying. However, there are only a few execution animations per enemy, and as the game relies on throwing large mobs of the same foes at you, these soon become tired. Watching an Ork get smashed in half is awesome. Watching the same Ork get smashed in half for the 20th time isn’t. The fact that you still take damage during the uninterruptable execution animations also means that, when surrounded, they’re utterly useless; hit that button and you’ll be dead before you can saw off that Ork’s nose, let alone his face. Winter is coming to WWII, as we find out in our Company of Heroes 2 Preview. THQ's upcoming Warhammer 40K MMO has been cancelled as the company lays off 118 employees.